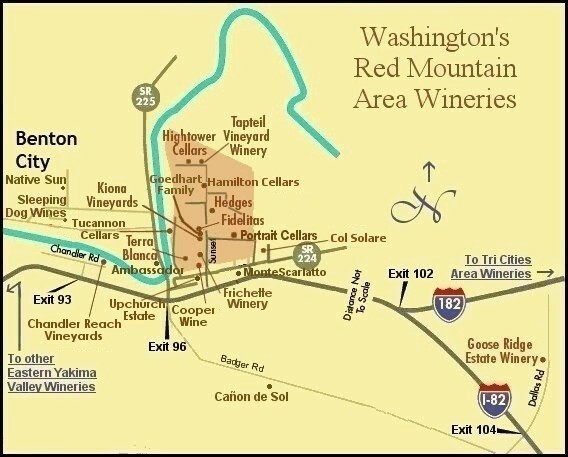 Red Mountain is Washington’s smallest AVA and perhaps its most distinctive. This compact patch of dirt (see larger map below) has produced the grapes for some of the state’s most celebrated red wines. There’s a real sense of place in the wines according to critics, so the “drink local” part of this post’s title makes sense. But think global? Well, yes. The wine world is very interconnected; international influences are surprisingly common and take many forms. A visit to Red Mountain (Sue and I were joined by research assistants Bonnie and Richard) revealed two of globalization’s many local faces. You might not expect to find one of the legendary names of Italian wine here on Red Mountain, but as you motor up Antinori Drive towards the beautiful winery at the top of the road the association becomes clearer. Col Solare (Italian for Shining Hill) is a joint venture of Tuscany’s Marchesi Antinori and Washington State’s Ste Michelle Wine Estates (SMWE). There has to be a story. Here it is. It must have been about 20 years ago that Piero Antinori came to America, looking for a wine-producing partner. He wasn’t interested in making an American super-Tuscan. He wanted to do what he thought America did best: Cabernet. So, as the Ghost Busters used to say, “who ya gonna call?” if you want to make great Cabernet? The answer was obviously André Tchelistcheff, the legendary wine maker at Napa Valley’s Beaulieu Vineyards and consultant to many important wineries (including Chateau Ste Michelle). Where in America can I make distinctive Cabernet? Tchelistcheff knew what advice to give because in fact he had already given it to his nephew Alex Golitzin who founded Quilceda Creek winery, which makes some of Washington’s highest-rated Cabernets. Tchelistcheff’s advice to Antinori was much the same and resulted in the partnership with Ste Michelle Wine Estates and the Col Solare winery we see today. The first wines, starting with the 1995 vintage, were made with grapes sourced from several Columbia Valley vineyard sites and produced at a nearby SMWE facility, but eventually the focus on Red Mountain grew stronger and the showcase winery was finished just in time for the 2006 crush. The estate vineyards radiate like the rays of the sun on the hillside below the winery. The partnership has grown since that first step. SMWE is now the sole importer of Antinori wines into the U.S. market and in 2oo7 the two partnered again to purchase the Judgment of Paris champion Stag’s Leap Wine Cellars. Quite a successful partnership — you’ve got to believe that Tchelistcheff earned his consulting fee. Col Solare is interesting to me because of the global-local connection. The wine is Cabernet-based, as Antinori wanted, but with a distinct Red Mountain twist, which means that it includes a little bit of Syrah in addition to the usual Bordeaux suspects since Syrah does so well here. Col Solare is an impressive achievement. Everyone we talked with on Red Mountain seemed glad to have them there. SMWE and Antinori are good neighbors, good customers for the local growers and good advocates of Red Mountain and its wines. Red Mountain isn’t a first class wine tourist destination yet — the infrastructure needs further development and another couple of winery tasting rooms wouldn’t hurt either — but Col Solare is already a destination winery and worth the trip. Another destination Red Mountain winery, Hedges Family Estates, shows a different aspect of the local-global connection. Tom Hedges is a local boy, who grew up in the Tri-Cities area before the region became known for wine. He studied international business at the University of Puget Sound and then at the Thunderbird grad school in Arizona. I guess you could say that he got into the wine business through the side door — through the business side. Here’s how the Hedges website explains what happened next. In 1986 … Tom and Anne-Marie created an export company called American Wine Trade, Inc., based out of Kirkland, Washington State; they began selling wine to foreign importers. As the company grew, it began to source Washington wines for a larger clientele leading to the establishment of a negociant-inspired wine called Hedges Cellars. This 1987 blend of Cabernet Sauvignon and Merlot was sold to the Swedish Wine and Spirit Monopoly, Vin & Sprit Centralen, the company’s first major client. So you could say that Hedges Cellars was created to satisfy a global demand. Soon Hedges was breaking ground on his Red Mountain estate. Today Hedges is the largest family winery in Washington and was instrumental in establishing the Red Mountain AVA. It really is a family operations. Tom and his French-born wife Anne-Marie are proprietors, brother Pete Hedges makes the wines, Tom and Anne-Marie’s daughter Sarah is assistant winemaker and son Christophe is director of sales and marketing. The wine portfolio ranges from the Hedges Red Mountain estate wine (a Bordeaux blend, but with a bit a Syrah) to the popular CMS blends and the House of Independent Producers wines. Taken together I think Col Solare and Hedges Family Estates show the local-global nexus at its best, bringing international attention and expertise to local wines and taking those wines to global markets. We are often told that globalization suffocates local enterprise, but these wineries show that it can, in the right circumstances, breathe life into them. I can’t leave Red Mountain without mentioning two other stops we made that day. It was about time for lunch when we finished our visit to Col Solare and that can be a problem since I don’t think there are any restaurants on Red Mountain. But we had planned ahead for a picnic and so we headed to Fidélitas, where we bought a bottle of Charlie Hoppes’ delicious Semillon and dined out on the patio overlooking the vineyards. Turns out we didn’t need to bring food — Charlie had arranged for a local barbeque food truck to be available for weekend visitors like us — nice touch! Our next stop was the world’s best vineyard tour. Michael and Lauri Corliss (of Corliss Estates) had arranged for us to meet Mike McClaren and James Bukovinsky, who were working in one of the Corliss Red Mountain vineyards just up the road from Fidélitas supervising the mid-October harvest. We spent the best part of two hours with Mike and James, visiting every nook and cranny of the complicated site, learning about the careful matching of grape variety and terroir and tasting the perfectly ripe fruit. A real taste of Red Mountain. Thanks to Bonnie and Richard for their able assistance. Thanks to Wysteria Rush and Marcus Notaro at Col Solare and Tom Hedges and Deborah Culverhouse at Hedges Family Estates. Thanks to Michael and Lauri Corliss and Mike McClaren and James Bukovinsky for their hospitality. Photos: (1) Col Solare winemaker Marcus Notaro (in his classic Inter “Roberto Baggio” jersey), (2) the view down Red Mountain from Hedges, and (3) Mike, Tom and Richard in discussion at Hedges. You can see how tiny Red Mountain is on the map below. Can you repeat this trip with Joanie and I? I bought a lot of Hedges wines during our visit to Washington at Thanksgiving and coincidentally they were featured in the Club Vino Selections last month. Have a Happy Holiday.